Aaron Dunsmore broke the deadlock for East Fife. Pic by Kenny Mackay. With 30 minutes to go in this meeting between East Fife and Stranraer the Fifers seemed to be cruising towards the win. They were three goals to the good and looking more than comfortable. But then came the mother of all collapses as the visitors came storming back in the closing stages to score three of their own and salvage an unlikely point. After last weekend's disappointing 2-0 defeat to Montrose, boss Darren Young made a couple of changes, handing rare starts to Scott McBride and Kyle Bell. The freshening up of the squad looked to have paid off as East Fife took an early lead through Aaron Dunsmore's excellent finish from the edge of the box. It was all going so well and Bell came close to making it 2-0 just a couple of minutes later. East Fife stayed on the front foot and quickly added a second when Daryll Meggatt stooped to head home a Scott Agnew delivery. The Methil men took a two goal lead in with them at the break and looked comfortable. They appeared to have secured the win early in the second half when ref Steven Reid played a good advantage on the edge of the box after Dunsmore had been fouled. The Fifers kept hold of the ball and worked it wide to McBride whose cross was nodded home by Craig Watson. With just under half an hour to go it seemed like the job was done. To their credit Stranraer stuck to their task and made a couple of substitutions which had a big impact. Innes Cameron in particular had a starring role after coming off the bench. The visitors grabbed the first of their three goals when Adam Cummins netted from the spot. It gave Stranraer a shot in the arm and they made it 2-0 when Cameron headed home a Chris McGowan cross. East Fife were having to hold on but you could sense an equaliser was around the corner. It duly arrived when Meggatt hauled down Cameron on the edge of the box. 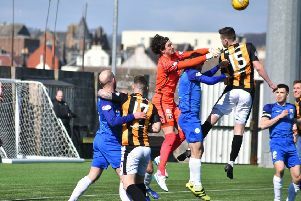 Ref Reid took his time in making his mind up on what to do next and after consulting with his assistant made the correct call in sending the Fife defender off and awarding a free-kick. To rub further salt in the wounds Stranraer netted the set-piece, McGowan finding the bottom corner. Cummins took his celebrations a bit too far, though, and was sent off in the aftermath. Bayview boss Young said: “For the first hour it was the best we’ve played in a while and have enough chances to score a few more.